When a remote gateway is configured to support the Configuration Exchange, it should be able to provide valid client DNS and WINS settings automatically. If not, uncheck the corresponding Obtain Automatically option for the DNS or WINS options and enter a valid DNS Server Address, DNS Suffix or WINS Server Address values for this site configuration. If specific DNS or WINS settings are not required for this site configuration, simply uncheck the Enable DNS or Enable WINS option. Please be aware that if the Enable DNS or Enable WINS options are used, a security policy may be required to communicate with these servers via the tunnel. 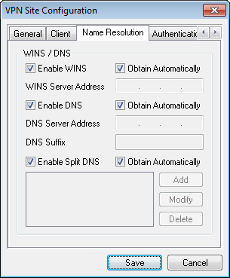 Enable Split DNS support if you would like to selectively send DNS requests to a tunnel specific DNS server. When this option is enabled, a client will inspect all DNS requests and compare them to a list of DNS domain name suffixes. If the request matches one of these domain name suffixes, the request is forwarded to the tunnel specific DNS server. Otherwise, the request is forwarded to a DNS server that is configured for your local network adapter. When a remote gateway is configured to support the Configuration Exchange, it should be able to provide a valid list of DNS domain suffixes that should be resolved using the tunnel specific DNS server. If not, uncheck the corresponding Obtain Automatically option for Split DNS and enter a list of DNS domain suffixes manually.